Roh identified a number of ways that a photographic image could be produced and advocated experimentation within and between these possibilities. He included photography that records the play of light to bring out tonal and atmospheric variation in the observation of a changing natural world. He also wrote about the striking applications of photograms that could produce a range of transparencies and tonal variation. He included the combination of text and photography, double exposure, negative prints and inversions from the negative. 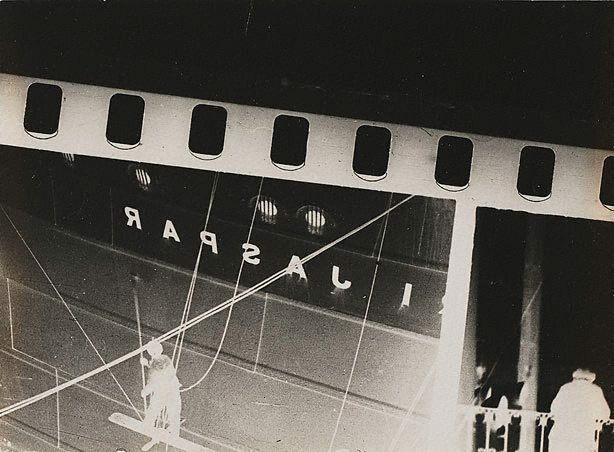 In ‘Untitled (shipload)’ Roh has printed from a strip of film placed on an angle through the enlarger; the image is inverted and printed as a negative. He not only exploits a number of his theoretical and technical innovations – such as the dynamic and unexpected angle of the shot – but also reveals the mechanism of the film process. Technology specificity in art is one of the defining attributes of modernism, making this exemplary for the medium of photography.